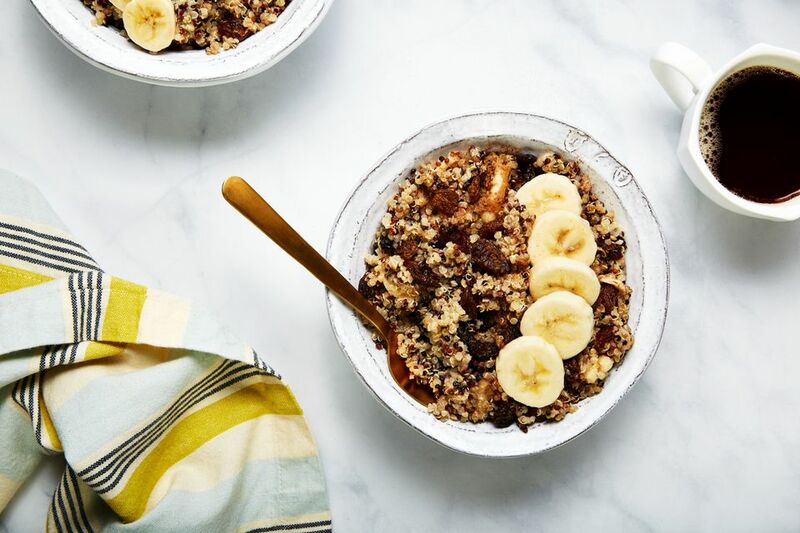 The maple, cinnamon, and raisin flavors in this simple quinoa breakfast bowl are familiar enough that kids will eat it right up. Add any kind of fruit that you have on hand - bananas, apples or berries would go well. If you don't have time to cook quinoa in the morning, cook it the night before, or, try using quick-cooking quinoa flakes. Keep some leftover quinoa on hand to make breakfast recipes like this super quick and easy. If you like having quinoa for breakfast, be sure to check out these 7 ways to have quinoa for breakfast. This breakfast quinoa porridge recipe is vegetarian, vegan, high-protein and gluten-free. Reprinted with permission from the Everything Vegan Cookbook. Heat the quinoa and water in a small saucepan and bring to a boil. Reduce to a simmer and allow to cook, covered, for 15 minutes, until liquid is absorbed. Remove from heat and fluff the quinoa with a fork. Cover, and allow to sit for five minutes. Stir in the margarine and soy milk, then remaining ingredients.